Tefillin boxes (housing) of thin leather with reinforced partitions and sides on the "head" tefillin, long lasting, with a superior finish and color on all sides and at the base. Leather straps of quality top leather- 14 mm. (5- 1/ 2 inch) width. Kosher parchments. Computer printout of the portions. Manual proofreading. Price NIS 1,700 including embroidered velvet bag. 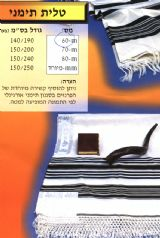 Additional NIS 100 for Ashkenazi Tefillin portions. 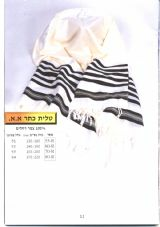 Please see related products below, such as: wool/ acrylic tallit. Contact us and we reply by email or phone. Tallittanya ,Woolen tallit in three sizes. Click to enlarge. 100% wool in an assortment of sizes and shades. Click to enlarge. Tallittanya Woolen tallis in four sizes. Click to enlarge. Lightweight, in a variety of shades and sizes. Click to enlarge. Tallittanya Wool blend tallit in three shades. In seven sizes. Click to enlarge. Woolen Tallitaniya tallis in an assortment of shades and sizes. Click to enlarge. 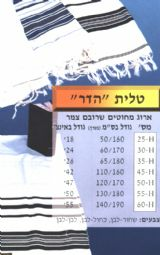 Woolen Talitaniya tallit in an assortment of sizes, also in white. Click to enlarge. Tallittanya Smaller sized tallitot in three shades.In seven sizes. Click to enlarge. 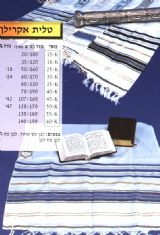 Woolen tallit in an assortment of sizes, also in white. Click . 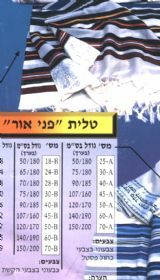 Tallittanya Woolen tallit in four sizes. Yemenite custom. Click to enlarge. 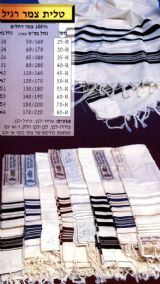 Woolen tallit in a variety of shades and sizes. Click to enlarge. 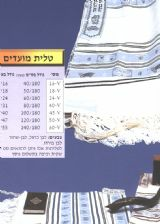 Talitaniya Tallit in three shades. In five sizes. Click to enlarge. 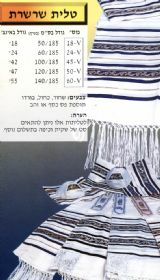 Woolen Talitaniya tallit in three sizes. Click to enlarge. 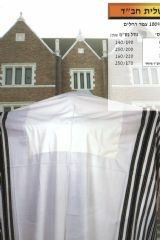 Woolen Tallit Chabad custom. In three sizes. Click to enlarge. Special order only. Click to enlarge. In a variety of colors. 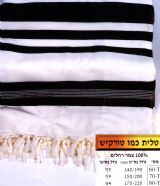 Tallit and Tefillin set. Click to enlarge. Embroidered Citadel on corner and embroidered lettering. Click to enlarge. 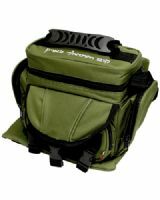 Water and damage resistant, includes a tallis bag.